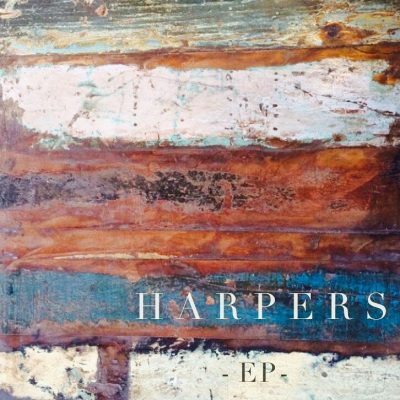 Harpers is a four-track, self-titled EP by local band Harpers. While short in length, the indie folk-rock album is lively and groovy. The EP opener starts with “Shine On Me Again,” which kicks off with moderately played, high note picks on the acoustic guitar, setting the mood of the song before the vocals interject 20 seconds later. Subtle percussions and growing synthesized echoes later fill the track with depth and a dream-state aura. Foot taps and head nods are inevitable on “Out Of The City.” This upbeat, catchy, indie folk-rock tune welcomes repetitious thumps and strums on the electric guitar, drums, piano and harmonica. Equi-volume vocals draw out words, framed by dramatic starts and stops on the piano, supported by dynamic electric shifts in the background. “Foxhole” is similarly quick rhythmed, yet embodies a more rock-centered approach with more attention on the electric guitar. Tapping drum sticks preface short strums on the guitar and shaker beats. While more electrically arranged, theatrical pauses and low-volume acoustic strums bring warmth and a modern-folk vibe to the song. While most of the album features the electric guitar, “The Land Of Milk And Honey” is a sweet-sounding folk ballad instrumentally driven by the piano, acoustic guitar, and soft drumming. The track is lyrically poetic, as lead and distant background vocals sing “Living in the land of milk and honey / Following the flow like a river running.” Midway through the song, a lyricless break—other than subtle “oohs”—showcases a wailing harmonica, sliding piano and a brass horn–like croon.